Do you want to see and experience Italian elegance in Cagayan de Oro’s multi-awarded sustainable condominium? 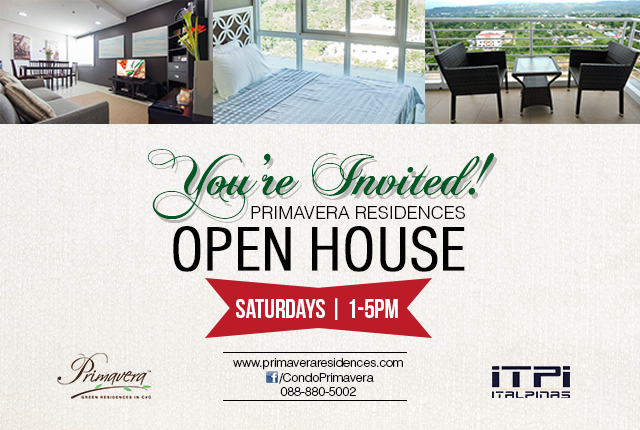 Primavera Residences invites guests to a weekly open house every Saturdays from 1PM-5PM. “Experience the condominium lifestyle as we bring forth Cagayan de Oro to a whole new level of living. As a city of growth and advancement, we offer to you the most worthwhile investment you could ever get,” Jun Garing, a real estate expert, said. Every Saturday afternoon, guests will be treated to snacks, freebies, and a tour of the facilities to view the units of Primavera Residences and enjoy the scenic views from what is considered to be Cagayan de Oro’s highest peak. “See for yourself why Primavera is a locally and internationally-acclaimed development of Italpinas,” Garing expressed. Primavera Residences’ developer, Italpinas Euroasian Design and Eco-development Corporation (ITPI), an Italian-Filipino real estate firm, specializes in green architecture and design which brought in recognitions and awards globally. The green building is furnished with energy-saving features such as cantilevers that protect the units from direct sunlight, thereby reducing temperature inside the building, and an indoor courtyard that maximizes natural ventilation and lighting. Solar panels will also be installed at the roof deck by June 2015 to power the building’s common areas. The mixed-use property also employs high-performance design, ensuring that the building will be able to withstand earthquakes and extreme weather conditions. Last year, Primavera Residences was recognized as the Best Mixed-Use Development in the Philippines for 2014-2015 by the International Property Awards at the Asia Pacific Property Summit in Kuala Lumpur. “Grab this opportunity to own a unit at the pioneering condo development in Cagayan de Oro. We only have few units left, that’s for sure,” Garing concluded. For inquiries about the weekly open house, please call 0917-794-2221, 088-880-5002; or talk to our accredited realty partners and agents. Do you want to know more about the building? Visit Primavera Residences by checking out our website here.